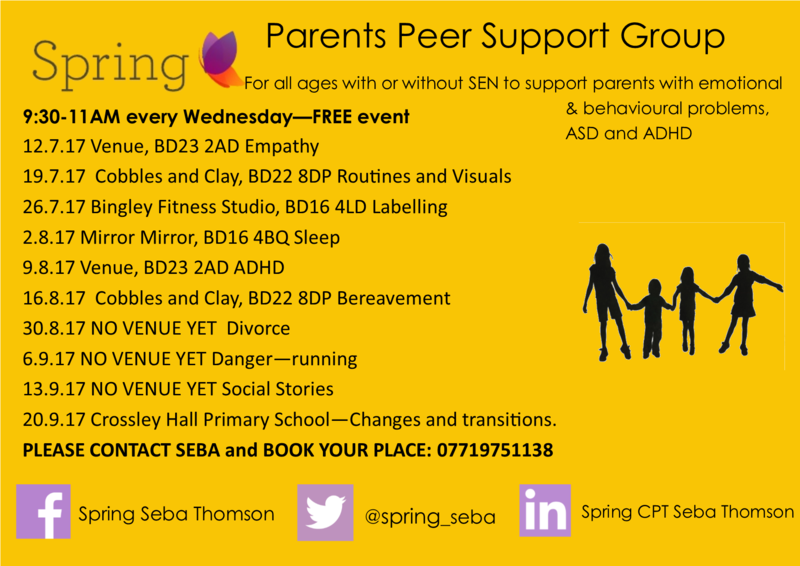 I have not completely stopped the Parents Peer Support Groups but I am looking for Schools and Children’s Centres to take up some dates from September onwards. I am currently meeting with various Head Teachers, SENCo’s and Children Centre managers to come up with a schedule of events to relaunch the PPSG. I will provide a free 1 hour session on various topics from ASC, ADHD, emotional and behavioural challenges, Growth Mindset to Mental Health topics aimed at parents. They take place preferably on a Wednesday morning from 9.30am – 11am but this is negotiable. You will provide a room big enough for parents to sit in, with a power supply so I can plug in my laptop, projector and room for a pull up projector stand. Previous hosts have after hosting these sessions asked me to run their own parental workshops specifically for their parents needs and INSETs for their teaching staff. Parents have said how much they have enjoyed the sessions and that they have learned a lot from them. Attached is a poster from June with the types of topics I can provide for your parents. If you are interested please contact me so we can talk about dates and topics that might suit the parents in your school or Children’s Centre.